La Brasserie is a small, classy French-German restaurant located on Davie Street. Upon arriving, we were quickly seated to our table and we noticed that the kitchen was open to the rest of the restaurant for diners to see. A quick look at the food menu and you will notice an appetizing selection, all with a reasonable price. What prompted me to dine here were the great reviews and amazing photographs taken by other diners who had visited before. The Moules Marinéres ($10) was our choice of appetizer to share for night as the pricing of the dish caught my eye. The 1/2 pound of mussels leaned more towards the smaller size as they were not very plump at all. However, the white whine broth that the mussels were bathed in was delightfully aromatic and flavourful. For the mussel lovers, there is also the entree version of this dish which features 1 pound of mussels and frites on the side. 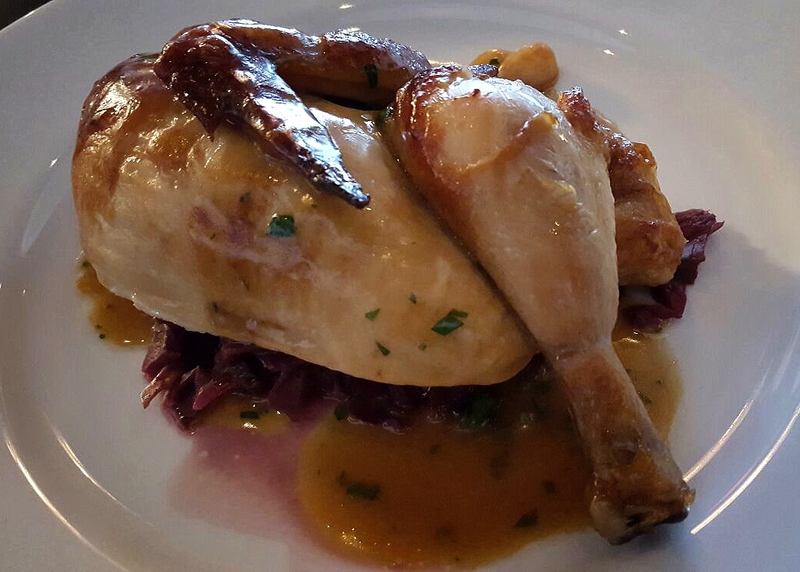 As an entree, the recommended Beer Brined Rotisserie Chicken ($23) was served with diced up red cabbage, confit garlic jus, and fries on the side. The chicken was oven roasted perfectly which was not drying at all, but rather tasteless. The red cabbage was certainly not touched which I did not find it fitting with the dish. The fries were served with the restaurant’s own unique homemade ketchup which had a touch of cinnamon and star anise mixed into it. The other dipping sauce that came with the fries was a light and fluffy mayonnaise. These were both great dipping sauces if you want to enhance the flavouring of the fries. Our other entree was the Steak Frites ($23) with the option of one of two sauces to choose from (either cafe de paris which is more of a buttery sauce, or peppercorn sauce). On a side note, the peppercorn sauce was over empowering with noticeable large peppercorns that I found to be quite spicy when I bit into it along with my steak. However, the steak was cooked perfectly medium rare as per what I had requested. It was easy to cut with juice squeezing out as I chewed on the meat. It was definitely one of the most satisfying steaks I had eaten despite my indifference towards the peppercorn sauce. 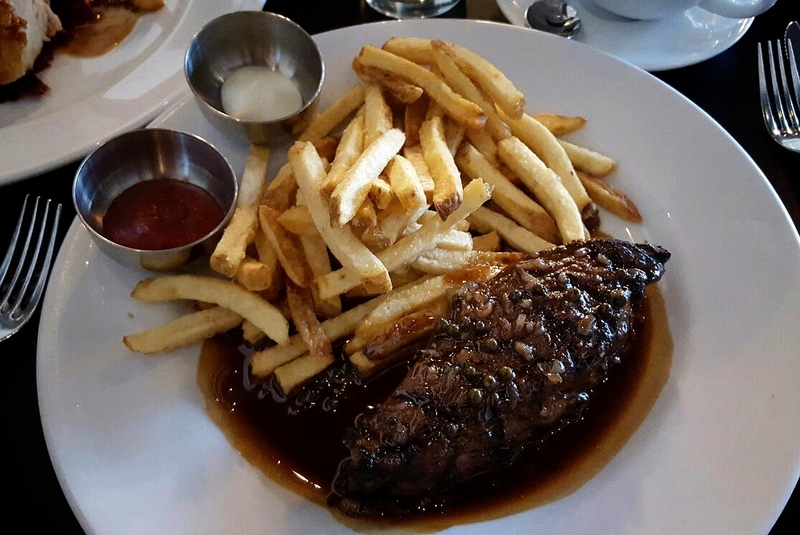 As for the frites, they were crispy and golden, making a perfect side to the steak. To conclude, the food was still really good despite some of my complaints. I would definitely return again to try some of their other items on the menu. As well, our server was friendly and very accommodating which made my dining experience here remarkable. This makes no sense. If the chicken was tasteless and the cabbage was untouched as well as the peppercorn sauce being overpowering (that is what you meant, no?) why would you want to go back? I meant to say I want to come back and try their other food.